Terance Mann’s running fall away prayer is answered as 4 seed Florida State defeats 5 seed Virginia Tech 65-63 in OT. …but it was ultimately Florida’s Andrew Nembhard who allowed Florida to move on and send LSU home. Florida’s run through the SEC Tournament came to an end on Saturday, literally at the hands of Auburn…. Indiana has as many Big 10 tournment wins in 5 seasons as 13th seeded Nebraska has in 2 days. Marquette-Seton Hall game in one tweet: 85 free throws, nine technicals, three ejections, four guys fouled out, there was a scuffle, Myles Powell was ejected then wasn’t, words exchanged in handshake line, game was three hours without overtime, Seton Hall won by two. Meanwhile, at the end of the tournament it was once again Villanova that walked away as the champion… AGAIN. Villanova lost four players to the NBA and still won both the Big East regular season and tournament titles. The mark of a true Blueblood Program. Tournament week in Las Vegas began with the West Coast Conference Tournament where St. Mary’s earned an automatic bid by getting the best of Gonzaga. …and it ended with Oregon winning the Pac-12 Tournament to steal a bid from a team on the bubble. Dana Altman will beat your five with his, then take your five and beat his. College basketball will never have a consistently great product as long as officials don't have to answer questions about the decisions they make in games like this one. 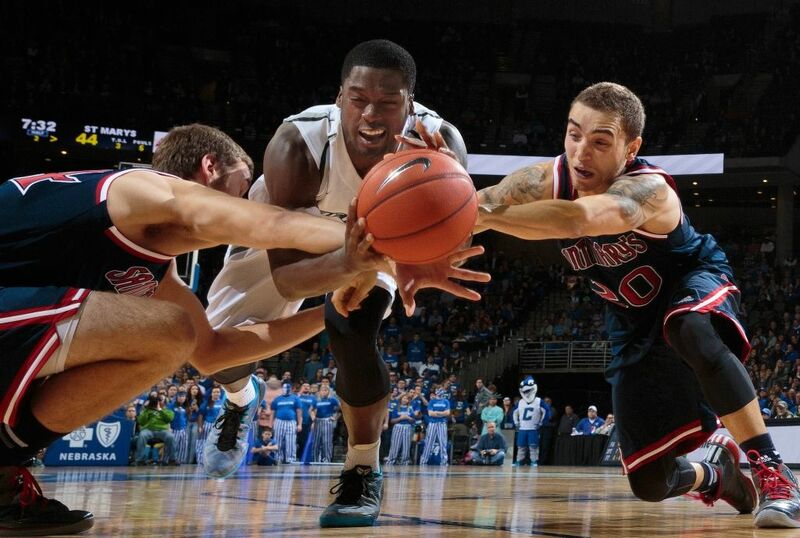 How about this Big East officiating? Horrendous calls the last couple of nights. Cannot believe at this level of college basketball that we would see this. By and large, I have enormous respect for what these guys do over the course of the season. And as painful as questionable calls can be, the monitor review process will almost assuredly come up time and time again next week. Getting the correct call is important, but too often these reviews kill any flow to a game. Add in the fact that they act as de facto timeouts for teams that often do not have any to call and you have a situation that creates more problems than it solves. 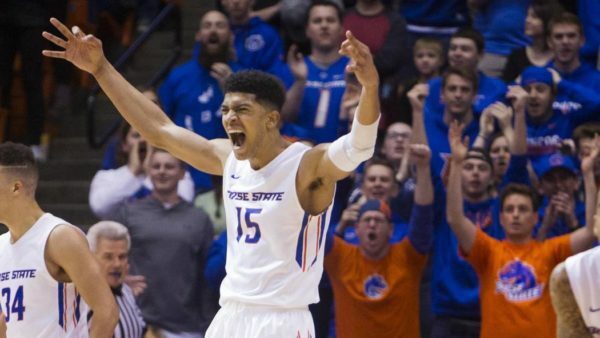 Every NCAA Tournament there is at least one unknown player from a little-known school who captures the nation’s attention. Sometimes for a half, sometimes for a game, sometimes for a magical run to the second weekend. Here are some of the likeliest O26 candidates to reach the Dance and put on a show next month. Jaylen Adams – St. Bonaventure. Adams was named to the Preseason Wooden Award Top 50 for the second straight season, which made his early absence extra disappointing. Luckily, Adams made up for lost time. Since making his debut on December 2, he has posted 20-point, 6-assist performances on six different times, including back-to-back 40-plus point efforts against Duquesne (40 points) and Saint Louis (44) this month. He ranks third in the Atlantic 10 in both scoring (20.2 PPG) and assists (5.3 PPG) while ranking eighth nationally in three-point percentage (51% 3FG). Against the Dukes and Billikens alone, Adams combined to shoot an absurd 18-for-26 from long range. As things stand right now, the Bonnies are on the NCAA Tournament bubble. If they sneak in, Adams has legitimate Steph Curry 2008 potential. Mike Daum – South Dakota State. If you’re reading this, you’re probably already well aware of Mike Daum. The 6’9″ forward is an offensive machine who ranks eighth nationally in scoring (23.3 PPG) and leading the Summit League in rebounding (10.0 RPG). As good as his back-to-the-basket game is — and its pretty doggone great — Daum has also developed into a lethal outside shooter, knocking down 41 percent of his 150 shots from long-range. In games against Kansas (21 points), Wichita State (31 points), and Colorado (37 points), the big man proved he can be just as effective against NCAA Tournament-caliber opponents as he can against the rest of the Summit League. Perhaps more importantly, his team, which lost to Gonzaga by 20 points as a #16 seed last March, looks more on track to be a #12 or #13 seed this season if it qualifies. As a #12 seed in 2016, Daum and the Jackrabbits nearly toppled Maryland. 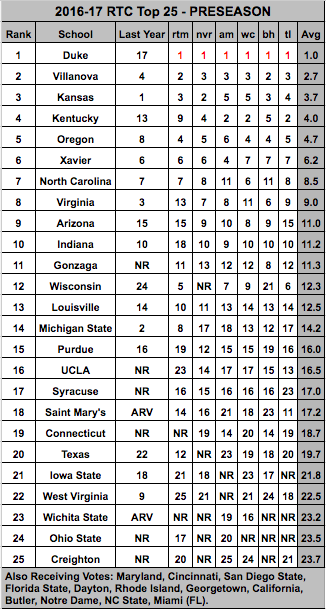 A quick glance at the top of the college basketball rankings reveals that blue-bloods roam the landscape. Duke, North Carolina, Indiana, UCLA, Kansas, Kentucky and defending champion Villanova all currently inhabit the top 10. For a mid-major school, the path to a #1 seed in the NCAA Tournament is fraught with so many hurdles that it may seem all impossible. This is certainly not a new development, of course, as 37 of the last 40 top seeds in the Big Dance came from a power conference — the exceptions were Wichita State (2014), Gonzaga (2013) and Memphis (2008). 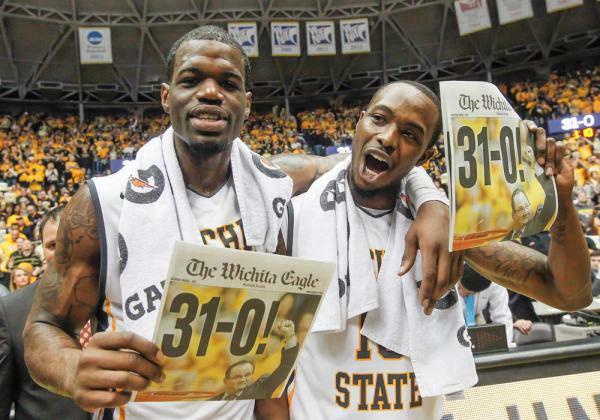 Those three teams from the Missouri Valley Conference, West Coast Conference and Conference USA, respectively, entered the NCAA Tournament with a combined record of 98-3, and their three losses came to teams with an average KenPom ranking of #32. Furthermore, each of those non-power conference top seeds played a top-40 non-conference schedule. The point of this is to show that mid-majors can most certainly earn a top seed in the NCAA Tournament, but their margin for error is next to nothing — the recipe seems to involve running the regular season table or suffering a maximum of one loss. This year’s crop of teams constituting the elite of the non-power conferences is made up of three excellent teams. There are significant barriers to entry, but each of the three has at least a respectable chance of joining the top line conversation on Selection Sunday if their regular season goes exceptionally well. Let’s examine what each team must do to get there. 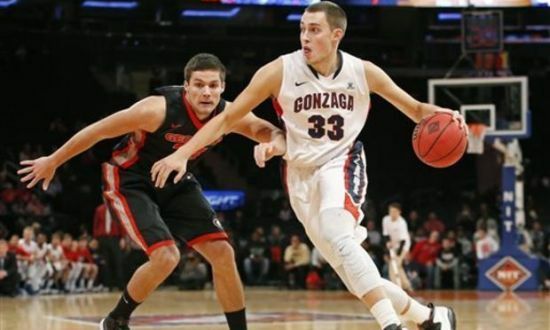 Gonzaga is the obvious choice if any mid-major this season has designs on a #1 seed. The Zags are currently #6 in the RPI and already have good-not-great wins over likely NCAA Tournament teams Arizona, San Diego State, Florida and Iowa State. With non-conference games still to come against power conference foes Washington and Tennessee, Gonzaga will have a case to make to the committee on Selection Sunday. An unbeaten regular season that would necessarily include at least two wins over St. Mary’s (currently #3 RPI) could put Mark Few‘s team into contention for a coveted top seed. A one-loss Bulldogs team would have a much tougher time given a non-conference schedule that rates weaker than years past and all the firepower at the top of the polls this season, so anything less than perfection probably means a ceiling of a #2 seed for the Zags. After a sizzling opening weekend followed by some Feast Week struggles, the Pac-12 finds itself facing a potential do or die week in terms of its national perception. Three teams will be front and center this week under the bright lights of ESPN and CBS, and after 71 games and even with all of December left, chances are it will be this week’s main events that set the tone for the Pac-12 come March. Part of the concentration on these games stems from factors out of the league’s control. Oregon’s injury issues have left it a shell of the team most expected it to be come March — the Ducks have already dropped games to Baylor and Georgetown without the services of Dillon Brooks (and have looked shaky even with him back). While the committee will factor Oregon’s injuries into its analysis, that doesn’t help the Pac-12’s overall profile. And that brings us to this week, starting this evening on the Peninsula. Not only is the Pac-12 counting on Stanford — the team picked to finish 10th in the league standings this season — but the Cardinal actually have two games with national ramifications this week. First, Randy Bennett’s St. Mary’s bunch (11th nationally, per KenPom) comes to Maples Pavilion tonight. The Gaels may not yet be a nationally-renowned name, but they drilled Stanford last season and will be a contender in a league (WCC) that has been quite the thorn in the side of the Pac-12 in recent years. This is one of two big Pac-12/WCC showdowns this week, and while it’s definitely the undercard, it’s still a big game for both teams and conferences. And so it begins — that wonderful time of year when we again hear familiar voices on the television and our favorite teams playing college basketball games that count. It is a beautiful time, indeed. With a sizable slate of games commencing this evening, we officially unveil the RTC 2016-17 Preseason Top 25. This poll will hold for about the next 10 days or so, but you can expect our weekly regular season poll to come out every Monday morning starting on November 21. Along with the RTC25 rankings will be the usual quick and dirty analysis that dives a bit more deeply into how those teams shake out from top to bottom. To see how we did last year, check out our 2015-16 preseason poll — sure, we nailed a few (Kansas, North Carolina, Oklahoma, Villanova), and missed on some others (Maryland, Michigan, LSU, Vanderbilt). We promise we will try to do better this time around. Here’s the preseason poll. The Saint Mary’s Gaels have risen from seemingly nowhere to become one of the best teams in the country. Quite likely, they are the best team that you know nothing about. But you may be forgiven for your ignorance, because the revolution has rarely been televised. In the seventeen games the Gaels have played, they have appeared on national television (if you call ESPNU national television) just twice: once in November when they beat Stanford by 17, and then again on New Year’s Eve, when they beat BYU by 11. Now, here they are, poised to soundly defeat Gonzaga (that’s right, soundly) at home tonight—again on ESPNU—and yet no one knows about a thing about the Gaels. Let’s fix that. 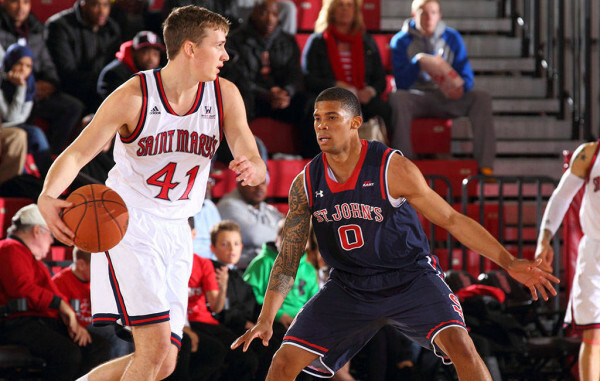 The 2014-15 iteration of St. Mary’s was a perfectly good team. Led by All-Conference big man Brad Waldow, the Gaels narrowly missed the NCAA Tournament and instead settled for the NIT; it wasn’t the best season Randy Bennett has ever had at St. Mary’s, but it was perfectly respectable. The Gaels were graduating five of their top six players, though, and replacing them with the following cast: rising sophomore point guard Emmett Naar, who had looked good his freshman year but was never expected to carry the load; Boston College transfer Joe Rahon, who had a solid but unspectacular two years with the Eagles; four underclassmen reserves who had been asked to do very little last year; and a freshman class led by three star center Evan Fitzner and four guys no recruiting service had bothered to rank. A down year seemed imminent. Okay, okay, we get it… the Big 12 is awesome. I’ve made that pretty clear in past columns, and you probably don’t need me to tell you something so obvious. Monday night offered up yet another prominent example, when a “Kansas is back to its dominant self” narrative in the first half against Oklahoma turned into one of the best games of conference play this season. But rather than raving about it, let’s think big picture: What do we make of the Big 12 race? A few teams will definitely be involved. One is Kansas, of course, which hasn’t missed out on at least a share of the regular season crown since Bill Self’s first year in Lawrence. Two more are Texas, which seems to have found its footing, and Iowa State, which finally cleared the Kansas hurdle over the weekend. 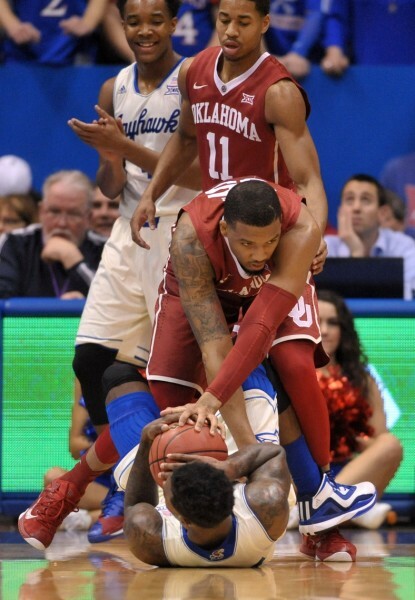 Oklahoma should be in the running too, despite losing three of its last four. What other teams could have a say in the matter? How about Kansas State, which is tied for the conference lead at 4-1? What about West Virginia, currently 15-3 and a top-15 KenPom team? Or Baylor? Or Oklahoma State? It’s probably safe to rule out those last two teams even though both are ranked among KenPom’s top 25, but neither is likely to beat the teams above them on a consistent basis. It’s also fair to exclude Kansas State from the discussion. The Wildcats are clearly much better than their non-conference performance suggested, but recent wins over Baylor and at Oklahoma don’t tell the full story either. They have some flaws. However, it’s probably a tad premature to rule out West Virginia. The Mountaineers play such a distinctly effective style this season, forcing turnovers on over 30 percent of opponents’ possessions, that will remain a problem to solve for all nine conference foes. They’re a possession away from a 4-1 Big 12 record and the upcoming schedule suggests that we shouldn’t be surprised if Bob Huggins has his team sitting at 6-2 when this column runs two weeks from now. It appears to be a five-team race. But whether you think the Big 12 has four, five, or even six or seven teams capable of winning the league crown, the takeaway here is that the race is wide open. And with Kansas’ astounding decade-long run in jeopardy, the next two months in Middle America are must-watch sports television. Iowa at Wisconsin | Tuesday, 9:00 PM EST, ESPN. Around this time last year, Iowa sat at 13-3 on the season and waltzed into Value City Arena to take on 15-1 Ohio State. The Buckeyes at the time were KenPom’s second-ranked team and their only loss had come earlier in the week at Michigan State. They also hadn’t given up more than 70 points in a game. The Hawkeyes delivered one of the more impressive Big Ten performances last season, winning by 10 points and vaulting themselves from seemingly out of nowhere into KenPom’s top five. They are presented with a similar opportunity tonight against Wisconsin. With the memory of last year’s collapse still fresh, many people remain unsure of what to make of Fran McCaffery’s team – the Hawkeyes have defeated a questionable Ohio State team twice and won at North Carolina, but the rest of their résumé is dubious. A win in Madison would force the nation to take notice. For Wisconsin, this is its first real test since the loss of senior point guard Traevon Jackson. It could provide a platform for replacement Bronson Koenig to step up his game, but it also could reveal a major midterm problem for Bo Ryan. Tonight’s game will tell us a lot about which it will be. So, late on Monday night I am navigating my way through the college basketball hub on ESPN.com, and I find this piece with different writers making predictions for the rest of the season that will either make them look smart or stupid. About a quarter of the way down the page is the headline “Take notice of the champs… and Oregon State“. John Gasaway’s “prediction that will make him look stupid” is centered around the Beavers upsetting UCLA in the Pac-12 Tournament championship, giving the program its first trip to the Big Dance since 1990. Stupid or not, a prediction is a prediction, and Oregon State fans will take it. Also included in this predictions post is C.L. Brown’s prognostication that Arizona will not receive a one seed for that NCAA Tournament. With four of its final six on the road and its performance without Brandon Ashley not exactly inspiring, this isn’t a bad pick. Joe Lunardi released his latest edition of Bracketology on Monday, and the Wildcats remain as a #1 seed in his projections. UCLA follows as a #5 seed, and then four Pac-12 teams (Stanford, Arizona State, California, and Colorado) are represented on the #9 and #10 lines. John Templon released his NIT projections as well earlier this week, and Oregon, Washington, Oregon State, and Utah appear in that field. Shortly after we talked to you on Monday morning, both the AP and Coaches polls were released and saw Arizona drop two spots to #4 after falling at Arizona State last Friday. The only other team to appear inside the Top 25 were the Bruins after their sweep of Colorado and Utah, but both Arizona State and Cal appear in the “Also Receiving Votes” section. Click here to check out Rush the Court‘s weekly rankings, where the Cats once again appear at fourth, the Bruins take 22nd, and Arizona State comes in at #29. 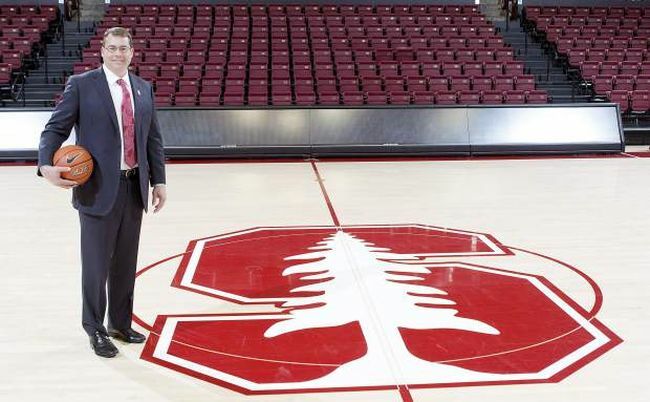 Stanford guard Aaron Bright will be transferring to St. Mary’s and be eligible to play immediately next season in Moraga. The senior appeared in seven games this season for the Cardinal before dislocating his right shoulder during a late November practice. In order to be able to play immediately, Bright has to find a graduate degree program that is offered by St. Mary’s and not by Stanford. According to this tweet, the Gaels have at least three of those; Kinesiology, an MA in Leadership, and an MFA in Creative Writing. Oh, and Australian Basketball Recruiting. I must warn you, the next link is a bit disturbing. Coaches at both Arizona and Arizona State are proposing the ridiculous notion that Pac-12 court rushes be prevented, possibly by as soon as next season. Sean Miller thinks the situation is a threat to the visiting team’s safety and inconveniences them when trying to get back to the locker room after the game is over. My thoughts? Who cares if you have to wait by the bench for a few extra minutes after the buzzer sounds? Have security in place like the ACC does to surround the staff and players, and let the kids have their fun on the floor.